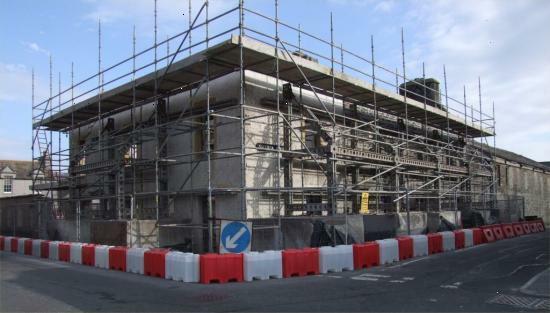 The development of new homes at Saltoun Street and Miller Street in Wick is well underway. The block now has the roof removed and the building has been stripped back to just the main walls. A courtyard at the back has now been opened up and the possibilities can easily be seen for the area in repopulating Lower Pulteney in the harbour area. A partnership including Highland Council, HIE, with Pentland Housing Association has brought together the required funding to make it possible for the development to happen. M M Miller Ltd won the contract and the transformation will add to the already much improved Telford Street and other streetscape improvements in the area. Pentland Housing Association is continuing their commitment to the regeneration of the Lower Pulteneytown area of Wick, and they are now converting some derelict properties on the corner site of Saltoun and Miller Street into three flats (1 x 1 bedroom, 1 x 2 bedrooms and 1 x 3 bedrooms). Two of the flats will be available for low cost home ownership through the Homestake scheme and one flat will be for affordable rent. The rest of the ground floor will be converted into office space for rent. The refurbishment will be to modern standards with the existing period details such as the stone fa�ade, windows, slate roof and dormer windows being retained. This project has been enabled through funding from Communities Scotland, Highland Council, the Lower Pulteneytown Townscape Heritage Initiative and HIE Caithness & Sutherland.